[Editor’s note: This is a guest post from Insikt, a white label loan origination and investing platform that enables any brand to lend to its customers and gives accredited investors access to invest in consumer loan portfolios. First, not all P2P lenders are created equal. Let’s remember that Lending Club and Prosper have the longest track records concerning underwriting and seasoned performance of all P2P lenders, and both survived the 2008 crisis. Lending Club is not CircleBack and Prosper is not the latest startup lender. So, why then is Moody’s putting certain bonds backed by Prosper loans on watch for potential downgrade while upgrading others? Is something wrong in the P2P world? Or is Moody’s losing its way? The answer is no to both. Moody’s actually got the bond ratings part right. (Their original loss outlook on Prosper loans, however, is different matter: see Monja article here). Although issued separately last year by Citi and BlackRock, the securitizations of Prosper loans looked an awful lot alike at first glance (see chart below). Citi’s pool contained 30,910 Prosper loans that were passively allocated, that is picked randomly without any supplemental screening to mirror the overall makeup of Prosper loans. BlackRock’s pool totaled 25,781 (also passively allocated). Differences in credit scores and loan sizes were negligible. The interest rate on loans in Citi’s pool averaged 13.2% compared to 14% for the loans securitized by BlackRock. But a careful analysis illustrates how differences in the way loans are repaid, how bond payments are distributed, and the “safety net” in each securitization can result in varying effects on bond investors — even those with similarly rated securities backed by virtually identical pools of loans. Acknowledging the similarities, Moody’s Investors Service said last month that it expected the default rate for both deals to rise an identical 50% — from an initial projection of 8% over the life of the loans to 12%. Yet Moody’s took distinctly different actions toward the Citi pool, known as CHAI 2015-PM1, and the BlackRock pool, known as CCOLT 2015-1. In the CHAI transaction, 15% of the debt securities – the Class C Bonds – were put on watch for a potential downgrade. Higher-rated tiers of bonds were unaffected. By contrast, in the CCOLT transaction, the better-rated Class A and Class B bonds in the CCOLT securitization were upgraded, while the Class C was unchanged. Not surprisingly, these seemingly contradictory actions confused many market observers. A close examination of the two deals, however, provides insight into Moody’s thinking along with important lessons for investors. Before diving into analysis, though, let’s bring you up to speed on securitization speak. First, Credit Enhancement (CE) is a commonly used term in the asset-backed securitization (ABS) world that refers to the safety net each bond in a capital structure enjoys as a buffer against higher than expected losses in a pool of loans, in this case, Prosper loans purchased passively by Citi and BlackRock. Subordination (also referred to as “hard” credit support) is the amount of hard investor capital below each bond that will absorb any defaults in a loan pool before that bond’s principal is impaired. As a rule, losses are first allocated to the junior (subordinate) classes (Residual and C) in order to protect the senior classes (A and B). Excess Spread (also referred to as “soft” credit support) is the difference between the interest received on the underlying pool of loans less interest payments owed to bondholders plus ongoing transaction expenses (such as servicing and trustee fees). Think of this as the profit and loss, or lending margin, on each loan made to a borrower. If loans are more profitable, their profit also acts as an important buffer against rising losses. In securitization speak this is called “soft support” because nothing beats actual investor capital (or “hard support”) acting as a safety net. Structural Enhancements: Securitizations generally have structural features such as an Interest Reserve Account or actual cash reserves that work to mitigate any potential cash flow shortfall in the underlying loans. As previously mentioned, the CCOLT and CHAI transactions have very similar collateral pools in terms of the credit quality and vintages of the Prosper loans backing each bond. The excess spreads of the two deals at pricing were also very similar before losses (10% versus 9.8%). Finally, the way cash flows are distributed to different bondholders and the tests used to determine any changes in the distribution priority were either identical or very similar. As the blue bars in the chart above indicate, the CHAI deal started with a 10.5% safety net (plus 50bps reserve account), which is higher than CCOLT at 5%. At first glance, the larger safety net would seem to be a positive factor. However, it’s important to consider by how much the safety net needs to increase until cash flows can be diverted, or “leaked,” to owners of the tranche below it, known as the residual or equity certificate. The CHAI deal stipulates that the 10.5% safety net only has to increase by 4.5% (10.5% to 15%) before cash flows can be leaked to residual class owners. Due partially to fast prepayments and the resulting pay down of the senior bonds, the 15% trigger was reached in the CHAI deal after only six months. The resulting premature diversion of cash flows away from the Class C bonds to holders of the residual certificate at this early date is problematic for the Class C bondholders as the monthly distributions to the residual holders are reducing the safety net that would otherwise protect the C Class from an increase in losses. In our view, these cash flow mechanics, coupled with a lower safety net, are the primary reasons for the Moody’s negative rating watch. In contrast, Classes A and B of the CCOLT deal have been enjoying a healthy build-up of subordination because the safety net protecting the bonds needs to increase by 10% (from 5% to 15%) before residual certificate holders can start receiving payments. 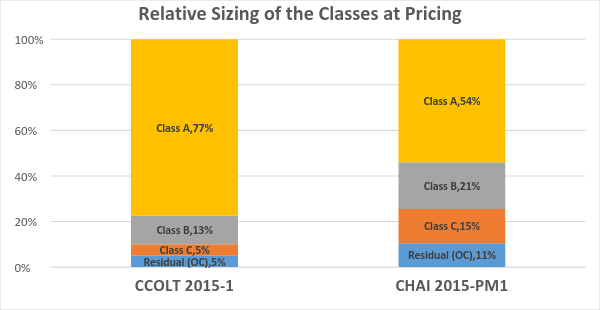 As a result of the higher required buildup of safety net (10% versus 4.5%) as well as faster than expected prepayments, the protection for both the A and B Classes of the CCOLT deal have almost doubled since pricing. We believe these factors are the primary drivers for the upgrade of Classes A and B, even though the cumulative losses of the underlying Prosper loans have reached 4.92% as of last month. CCOLT Class C bonds were not assigned a rating at pricing; however, we suspect that had they been rated, they would likely also have been put on negative watch for the same reason the CHAI Class C was put on negative watch (expected cash flow leakage to residual certificate in the near future). Despite the downgrade watch for the CHAI Class C, the senior bonds are enjoying a healthy build-up in their loss buffers of 57% and 31%, respectively. This explains why these bonds were already assigned higher ratings than the corresponding A and B classes of the CCOLT securitization at pricing. Securitizations incorporate many variables that can lead to significant differences in the performance of the bonds, such as how bond payments are distributed and the safety net protecting each bond. All things being equal, having too low of a required increase in the safety net protecting each bond can wreak havoc for investors, especially those in the junior Class C tiers. In this example, cash leaks too quickly to residual holders, which leaves less overall cash available for future bond payments, especially the junior tiers. This is precisely what happened in CHAI, which only required a 4.5% increase in the safety net from 10.5% to 15% before cash was leaked to residual holders. In short, it pays to have a much higher required percentage increase in the residual safety net. Loss projections at the inception of a deal are critical as they are one of the main drivers for the sizing of the safety net built into each bond tier and their resulting ratings. The 8% cumulative loss projection at pricing for a pool of 3- and 5-year passively selected loans was too low relative to the safety net built into each Class of bond. Had the loss projections been 12% upon inception, then the safety net for each Class would have been higher, all things beings equal, to achieve the same rating. It is very important to get this equation right upfront. In order to build risk resilient structured products, the credit quality of the underlying loan pool is paramount. It is also important to note that both deals were based on loans passively allocated from Prosper. It would be interesting to see how loss projections vary by purchasers who use an active selection approach, providing another credit screen of each loan separate and apart from the originator. We have completed seven securitizations of P2P loans that we select and buy actively, using our proprietary credit scorecard at Insikt. Each deal requires a doubling of the safety net of at least 10% before cash is leaked to residual owners typically occurring after month twelve. To learn more about our prior P2P securitizations or speak to me about how we think about credit selection and structuring, please check out Invest @ Insikt or contact me at capmarkets@insikt.com.